Peak is a global leader in the design, manufacture and support of high performance nitrogen generator systems for manufacturing & processing industries. As a leading global nitrogen generator manufacturer, Peak utilizes the latest air separation & gas purification technologies to create bespoke high-flow & high purity nitrogen gas generator systems for numerous industries such as Food & Beverage, Metal Fabrication, Pharmaceuticals, Chemicals, Electronics & more. Whether you require food grade nitrogen gas or an industrial nitrogen generator system for laser cutting, Peak will tailor our solutions around your specific industry requirements. Find out more about the industries we serve and how our nitrogen gas generator systems can help drive down costs, whilst increasing productivity & operational efficiency. Meeting your industry needs through repeated bulk nitrogen supply purchases is not only far more expensive, in the long run, than an on-site nitrogen generator unit cost, but is also more hassle and involves unnecessary safety considerations that cost both time & money - all of which are eliminated with a nitrogen generator system. Don’t buy nitrogen gas – make it yourself! Peak has over two decades of experience engineering highly efficient & reliable nitrogen gas generator systems. Our industrial range of i-Flow PSA nitrogen generator systems are the ideal solution for companies looking for an alternative to costly bulk nitrogen supply methods. Furthermore, strong industry partnerships with leading global air compressor & filtration experts means we offer more than other nitrogen generator manufacturers. 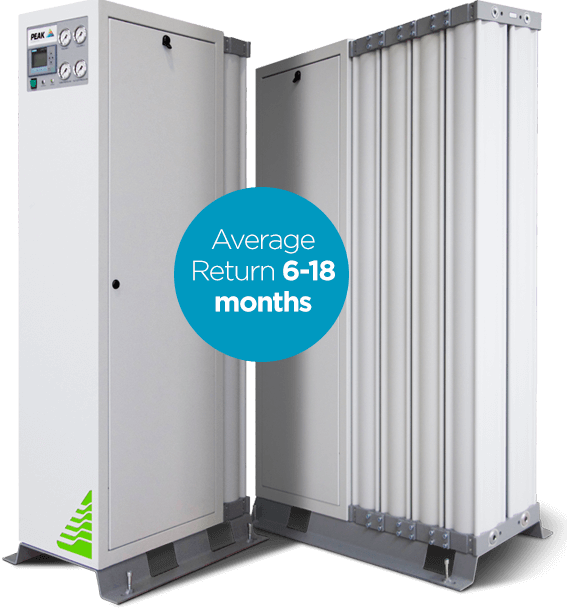 We work closely with customers to determine their precise application requirements and apply our knowledge, expertise to deliver a truly bespoke, complete & future-proof on-site nitrogen gas generator solution that is cost effective, energy efficient and extremely durable. Can I use a nitrogen gas generator for injection molding? What caused the CO2 shortage and how can you protect your supply chain in future? How is Nitrogen Used in Additive Manufacturing?